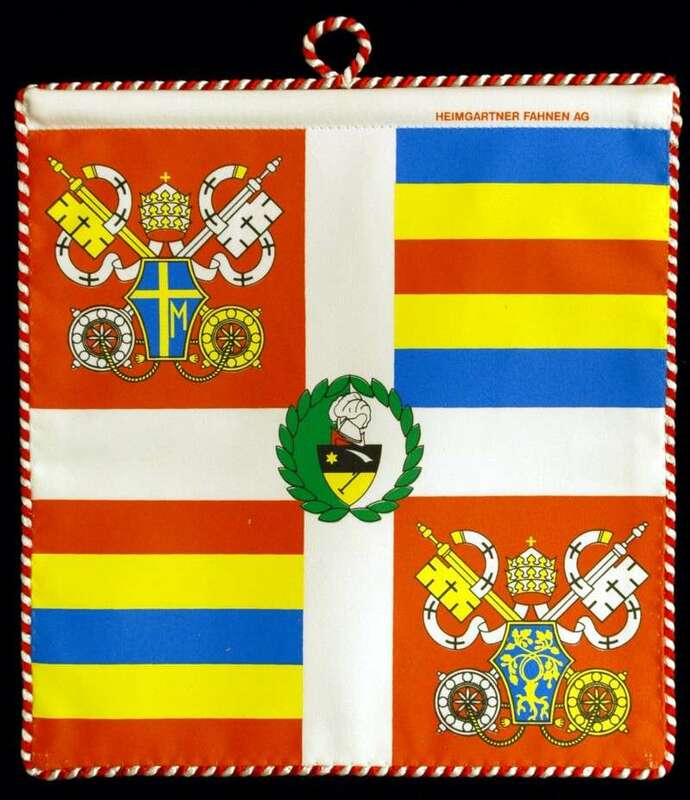 This replica flag was a gift from the Swiss Guard to Father Kunst in honor of The Vatican Comes to Duluth in 2004. Initially Father Kunst asked them if they could produce a flag for this event and they responded by producing a replica of John Paul II’s flag. Each flag has, in the upper hoist on the left-hand side, the coat of arms of the present pope. In the lower hoist on the bottom right-hand side, is the coat of arms of Julius II, known as the Warrior Pope. He started the Swiss Guard in the 16th century. In the center is the coat of arms of the Guard Commandant, Colonel Elmar Theodor Madar. There are two images on each flag containing the colors of the Guard as well. They are always blue, yellow and red. These are the colors of the Medici Pope, Clement VII, for whom many Swiss Guards gave their lives in 1527.